John C. Calhoun, a South Carolina planter and politician who never doubted the necessity of slavery, has often been judged harshly. TIME put him on the list of the worst vice presidents in America’s history. Calhoun’s career was long, complex and accomplished. He served in the House of Representatives (1811-1817) and the Senate (1832-1843, 1845-1850). He was also secretary of war (1817-1825), secretary of state (1844-45), and vice president (1825-1832). Calhoun was a vigorous promoter of states’ rights and a strong advocate for the South. In Napoleon in America, he appears as the US Secretary of War, with a hawkish interest in Napoleon’s activities. 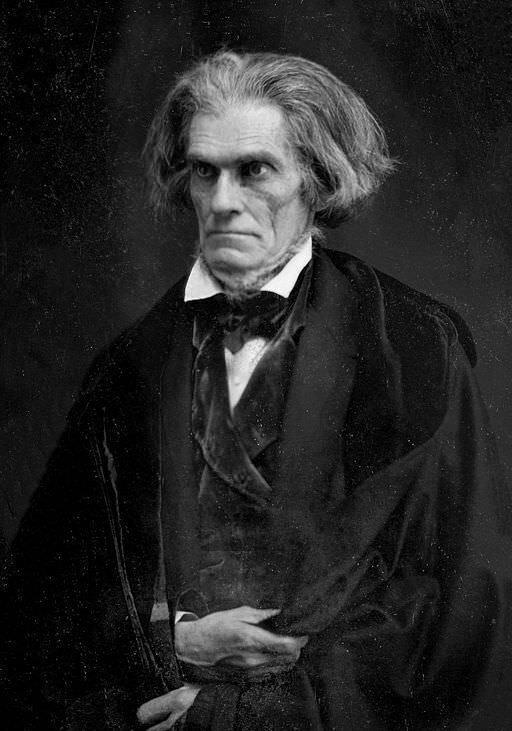 John Caldwell Calhoun was born near Abbeville, South Carolina on March 18, 1782. He was the fourth child of Scots-Irish immigrant Patrick Calhoun and his second wife Martha Caldwell. His parents and a beloved sister died when he was an adolescent. Raised in the South Carolina backwoods, Calhoun learned how to cultivate cotton and other crops. He remained a planter throughout his life. At the age of 20, John C. Calhoun entered Yale, where he studied law. He married his cousin, Floride. They went on to have ten children, seven of whom lived to adulthood. Calhoun was a caring family man, though his wife and offspring were frequent sources of concern. In 1810, Calhoun was elected to the House of Representatives. Virginia Congressman John Randolph coined the term “war hawk” to describe Calhoun, Henry Clay and a number of other young Southerners and Westerners who joined Congress at the time. They were hostile to Britain and resentful of the Royal Navy’s interference in American shipping. They accused Britain of encouraging Indian attacks on the American frontier. The war hawks drew the United States into the War of 1812. When President James Monroe appointed John C. Calhoun as Secretary of War in December 1817, the United States Army numbered some 8,000 men. They were responsible for defending an area of almost 2 million square miles. Morale was bad, pay was low, and discipline was harsh. There was no chief of staff, no centralized headquarters and no chain of command, except through the war secretary. The acquisition of uniforms, rations, powder and shot was contracted out as needed by individual supply officers. This meant dependence on local suppliers who charged monopoly prices for goods of poor quality. There was considerable anti-military sentiment among the American public. Calhoun centralized staff responsibilities in Washington. He established a surgeon general, a judge advocate general and a quartermaster general. Rations and supplies were purchased in bulk and stored at depots and arsenals throughout the country. Calhoun improved coastal defences and defence of the frontier. He also pushed for government funding of military education for poor, but ambitious young men. Calhoun transformed the Military Academy at West Point from a run-down army outpost into a national centre for military education. He supported the American career of French General Simon Bernard, and promoted US Army adoption of the Treatise on Artillery written by General Henri Lallemand. Calhoun was keen on improvements to communications and transportation. Calhoun urged Congress to fund a standing army, instead of relying on untrained militia augmented during war. His ultimate objective was an army with a core of professionally trained, well-paid officers. In peacetime, they could plan and man a set of coastal and frontier fortifications. They could also help construct the network of roads and waterways needed for defense and national growth. As war secretary, Calhoun was also responsible for the management of Indian affairs. In 1824, he unilaterally created the Bureau of Indian Affairs. Calhoun personally supervised the negotiation and ratification of 38 treaties with Indian tribes. Later in his career, he became an outspoken advocate of the US annexation of Texas, which gained independence from Mexico in 1836. John C. Calhoun perpetually wanted to become president, but the office remained out of his grasp. Instead he became vice president in the administration of John Quincy Adams. 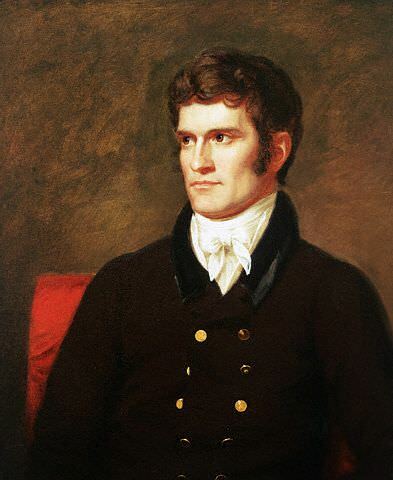 In 1828, Calhoun was re-elected to that office, serving under President Andrew Jackson, with whom he had a falling out in the “Petticoat Affair,” also known as the Peggy Eaton Affair. That episode is well described on Feather Schwartz Foster’s Presidential History Blog. Nineteenth-century British writer Harriet Martineau described Calhoun as follows. Your sister, I suppose, gave you all the incidents of our journey home. The weather was very warm and we had the accident of the stage turning over at the very commencement of our journey, but which was in other respects free from any mishap. On our arrival home, we had the pleasure of finding all well, with a good crop. Since our return, there has been several weeks of very warm & dry weather, which has burnt the corn crop, but still the prospect is good. The cotton was but little burnt and looks very well. Calhoun’s Washington home, Oakly, is now known as Dumbarton Oaks. His South Carolina plantation, Fort Hill, became the Clemson University campus (Thomas Green Clemson married Calhoun’s daughter Anna Maria). John C. Calhoun, First Speech on the Military Academies Bill, House of Representatives, January 2, 1816. John C. Calhoun, Speech on the Bill for Internal Improvement, House of Representatives, February 4, 1817. Harriet Martineau, Retrospect of Western Travel, Vol. I (London, 1838), pp. 147-48. Sarah Mytton Maury, The Statesmen of America in 1846 (Philadelphia, 1847), p. 169. Clyde N. Wilson, ed., The Papers of John C. Calhoun, Vol. XV, 1839-1841 (Columbia, 1983), p. 61. Clyde N. Wilson, ed., The Papers of John C. Calhoun, Vol. XIV, 1837-1839 (Columbia, 1981), pp. 399-400. Irving H. Bartlett, John C. Calhoun: A Biography (New York & London, 1993), p. 383. Mr. Calhoun, the cast-iron man, who looks as if he had never been born and never could be extinguished, would come in sometimes to keep our understandings upon a painful stretch for a short while, and leave us to take to pieces his close, rapid, theoretical, illustrated talk, and see what we could make of it.